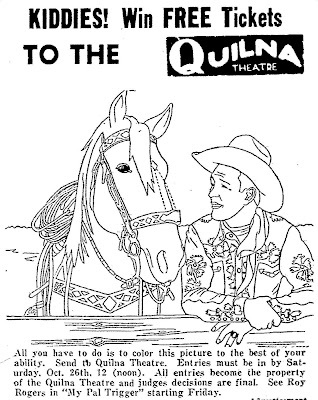 Kids could win movie tickets by entering the "Color Roy Rogers & Trigger" contest in 1946. The contest was held to promote the movie "My Pal Trigger". Aunt Jemima Pancake Flour had a "Color Claudette Colbert" contest in 1935. It was to promote the movie "Imitation of Life". 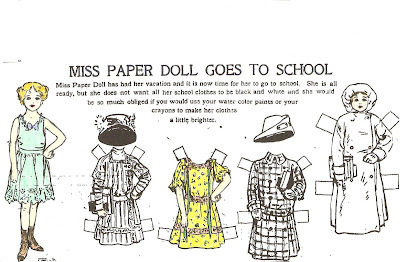 Miss Paper Doll was a paper doll series that ran in newspapers in 1911. 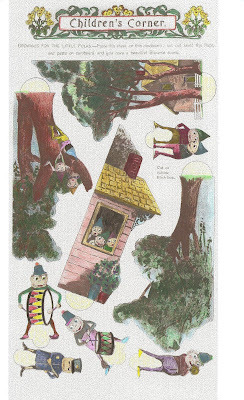 The series also included the furnishings from Miss Paper Doll's house. Bob Nolan, along with Leonard Slye (yep, thats Roy) and Tim Spencer, began the legendary "Sons of the Pioneers". He recorded this album in 1979. Bob Nolan passed away on June 16, 1980. 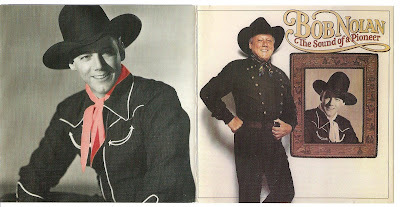 I have included this post in honor of Davey and his cowboy hat - and also because I love Bob Nolan. I would have been a Bob Nolan groupie if I had been born a few decades earlier, but I was only 17 when he passed away. Finally a Boots Cut-Out with Davey as a paper doll. Here are Pug and her nephew, Davey, going on a picnic. The day is September 02, 1951. Davey is wearing his cowboy hat and has an outfit that includes chaps to put on. He is obviously a Roy Rogers fan and dreams of riding Trigger and going after the bad guys. I can hear Bob Nolan and the Sons of the Pioneers singing "Blue Shadows on the Trail", a beautiful song. 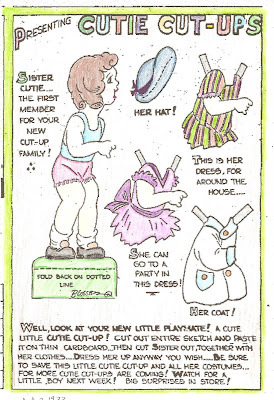 This Tillie the Toiler paper doll is from the Sunday comics, dated April 30, 1933. 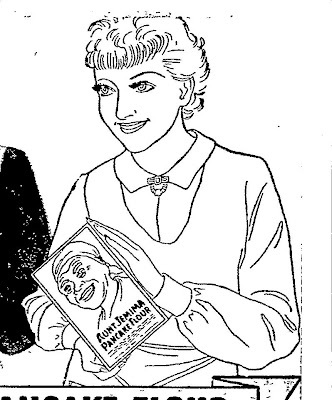 Aunt Elsie's Merry Makings was a section of the Sunday newspapers for children. This Aunt Elsie paper doll is dated September 14, 1919. I could not find the name of the artist of "Did You Lose A Dolly". 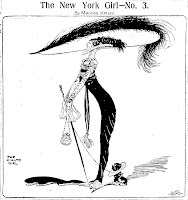 It is from a Sunday Magazine of the New York Tribune, dated June 26, 1904. Jacqueline is a member of the paper doll family created by Laura R. Brock. This series ran in newspapers from before July of 1933 to at least May of 1934. Laura Brock then began her Movie Star paper doll series. 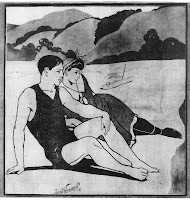 The Sunday Call Magazine, dated July 24, 1904 - "On The Beach" by John F. Woolrich. 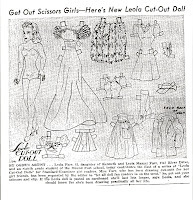 The Leola Cut-Out Doll was created by Leola Farr, a 13 year-old girl from Ogden, Utah. The Ogden Standard Examiner asked her to create a paper doll series for their newspaper. These two paper dolls are from March 1941. Here is a very pretty Babe paper doll. She is the wife of Horace and a friend of Boots. Edgar Martin, the creator of "Boots" also created the comic strip "Babe and Horace. This paper doll is from a newspaper on December 03, 1939. Sister's Dream paper doll is dated February 10, 1935. 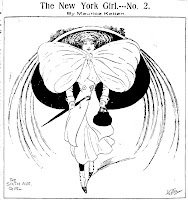 "The Tennis Girl" poster from the Sunday Call Magazine, dated August 24, 1902. And Here Comes Dora Bell! This Dumb Dora paper doll is dated April 25, 1935. The comic strip Dumb Dora, subtitled "She's Not So Dumb As She Looks", was created by Chic Young in 1924. Dora was a college student with a long roster of male suitors. Dora was actually quite smart and was always out-witting her boyfriends, leaving them to exclaim "She ain't so dumb!". Chic Young lost interest in the comic strip (he had Blondie on his mind) and Dumb Dora fell into the hands of other artists. Bil Dwyer took on the strip in the 1930's and Dumb Dora came to a conclusion in 1935. This Sister's Cut-Out is dated December 30, 1934. It is Uncle Ozzee Pozzee's Clozzees. 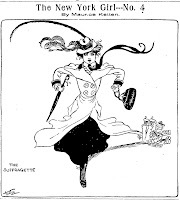 The Suffragette by Maurice Ketten is No. 4 in The New York Girl series. It is dated October 31, 1908. The Rialto Girl by Maurice Ketten is No. 3 in The New York Girl series. It is dated October 24, 1908. The Sixth Ave. Girl by Maurice Ketten is No. 2 in The New York Girl series. It is dated October 17, 1908. 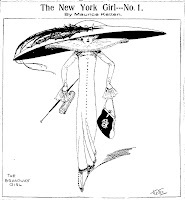 I found this wonderful series " The New York Girl" tonight while going through newspaper archives. The artist is Maurice Ketten. The Broadway Girl is No. 1 in the series and is dated October 1908. I have 19 illustrations from the series. I am sure this is a well known series - but it is new to me. 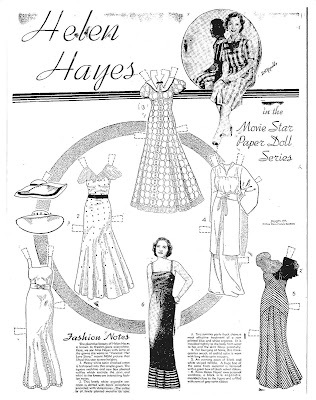 Here is Helen Hayes from the Movie Star Paper Doll Series that ran in a Brownsville, Texas newspaper in 1935. She is a very pretty paper doll. These two Cutie Cut-Outs are from the Sunday newspaper comic strip "Freckles and Friends" of July 1933. 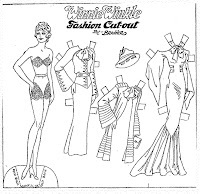 The Winnie Winkle Fashion Cut-Out paper dolls are from the 1935 Sunday newspaper comics. Here is Boots little sister, Pug, as a teenager. These paper dolls are from the 1950 Sunday Comics. 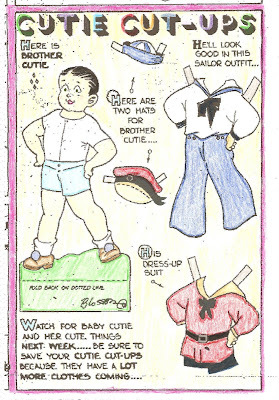 There were still Boots paper dolls well into the 1950's. Her household consisted of her husband Rod, her son Davey and her sister Pug. Here are two examples of work by Ethel Hays, newspaper illustrator. She had a weekly illustrated panel titled simply "Ethel". This "Ethel" panel is dated July 24, 1930. The other illustration is from a newspaper story and is from the early 1930's. 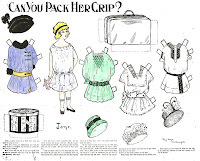 Raye Dryer was a newspaper illustrator and in 1913 began this paper doll series. Jane is the earliest paper doll in this series that I have been able to find. She is dated October 5, 1913. The series later focuses on twins, Jack and Jill, and their adventures around the world. 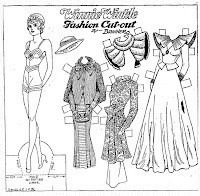 The last paper doll in the series is dated May 24, 1914. 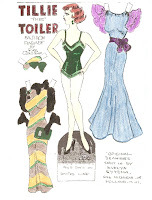 Here she is, the final Boots paper doll of July 1930. In total, the series consisted of three Boots paper dolls and nine outfits. The next Boots paper doll series begins in February of 1931. "A Windy Day" poster appeared September 14, 1902 in The San Francisco Call newspaper. Modern Mother Goose Cutouts - January 1937, Little Miss Muffet. This is the first paper doll I have in the newspaper series. 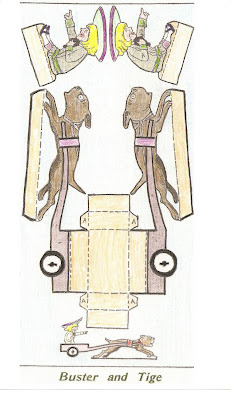 Another paper doll from The Modern Mother Goose Cutouts series. 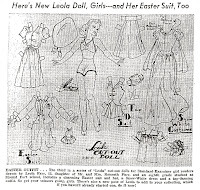 Little Betty Blue paper doll appeared in newspapers in January of 1938. Flapper Fanny was created by Gladys Parker. The Flapper Fanny and Betty paper dolls are from the Sunday comics, March 1935. Here's Boots again from July 1930 with three new outfits. 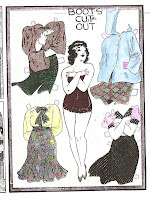 Anna Belle was a paper doll that ran in the Sunday newspaper comics in the year 1909. Brownies For The Little Folks - This cut-out appeared in newspapers on March 13, 1902. Here is one of several Buster Brown and Tige cut-outs that appeared in the Los Angeles Herald. This one is dated January 15, 1905. 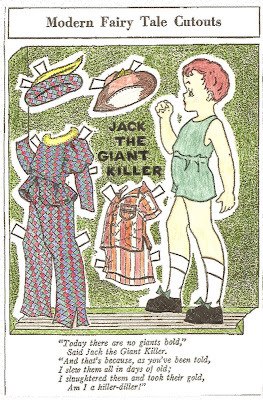 Paper doll of "Jack the Giant Killer" from the newspaper paper doll series Modern Fairy Tale Cutouts. The artist is Addie R. Woodruff. This paper doll is from November 1940.